Download Dr.Web programs, key files and license certificates directly from My Dr.Web Portal. All of your license details are stored in this section. At any time you can check a license's status and parameters and get the contact information of the company that supplied it. Links to renew and expand licenses are located next to the serial numbers. Remember, it does not matter how much time has passed since your Dr.Web license expired, you can always renew it at a discount — starting at 40% off if you renew for 1 year. The handy Dr.Web license purchase, renewal and expansion assistants located right in My Dr.Web Portal, will help you choose the license you need. 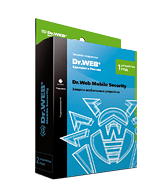 If you already use Dr.Web and have a newly purchased desktop or laptop that requires Dr.Web protection, expand your license for up to 5 PCs, free of charge, provided that your license expires in 3 months or less. In other cases you can expand your license at the renewal discount. You can do this in My Dr.Web Portal. The form for contacting customer support can be found in the Support tab. Here you will find the 24/7 support phone number (calls made within the territory of Russia are free!) and a link for contacting a virtual engineer who helps solve virus-infection problems remotely. To go to the archive of your requests, click on History of requests. If your key is blocked due to piracy (alas, this is often the case), you can restore your license free, but only once. To do this, go to the Blocked licenses section and next to the blocked license, click on "Replace serial number". A new Dr.Web key file will be sent to the email address you provided when you registered your license. Doctor Web pays great attention to educating users on the basics of computer literacy. Here you will find a list of available exams and a link to the exam registration page. If you pass the exam, you will be able to download your Dr.Web certificate in this section. A notification about registering your Dr.Web license will be the first message you see in this section. After that, Doctor Web reminders about the imminent expiry of your license and your renewal options will be arriving here. These messages are sent to the email address you provided when you registered your license. Messages associated with the license are stored in this section while the license is valid and for another 60 days after its expiry. In addition, you can enable special free SMS notifications and receive messages on your mobile phone about your license's expiry or an illegal attempt to use your license. How do I log in to My Dr.Web Portal? First, you need to start using Dr.Web and install the anti-virus on your PC, Mac or handheld. The My Dr.Web menu item is available in the application menu. To access the menu, right-click on the Dr.Web icon in the system tray. You can also log in using your serial number via this service. License certificate generator — get documentary evidence that your license was acquired legally. Individual distribution generator for Dr.Web CureIt! Form for scanning suspicious files and sending them to the Dr.Web anti-virus lab. Links to Doctor Web's pages on social media.